Manu defends the title! In a tight, final match, Emmanuel Bouchard narrowly defeats returning contender Kenny Shults, holding on to win his 7th consecutive world champion title in Singles Net. Julie Symons wins gold in Women's Singles, defeating Montrealer Geneviève Bousquet. Team Chaos - P.T. Lovern and John Leys - wins gold against Emmanuel Bouchard and Patrick Asswad in Open Doubles. Full results coming soon. Freestyle Finals goes BOOOOM! La Résistance packed the house tonight (Saturday), putting on a monumental footbag show, as Vašek Klouda takes gold in Singles Freestyle, followed close by Honza Weber and Gordon Bevier- all 3 with dropless performances!!! Vasek tops out Shred:30, and Toni Pääkkönen rips open the Sick3 contest with a Beast: Blurry Symposium Whirl > Whirlwind > Spinning Paradox Blender! Carol Wedemeyer defends her title against up-and-comer Verena Lenneis of Austria. Full story and Video highlights coming soon. Worlds is Bangin'! We'll have results up asap, and let you know who takes the glory in freestyle and net finals, plus video highlights. Freestyle Info Kit available for download. The kit includes the exact timetable of freestyle events, including FINALS, plus important rules and notices concerning the Rialto Theater and beyond. Please download the Kit, and read it now so you can ask us any questions you may have at Check-in. ALL: parties have been updated- all nights are filled except Friday, which you can use to recuperate or make your own plans. Freestyle: Big Shred spots have changed. Please see the updated freestyle schedule for details. 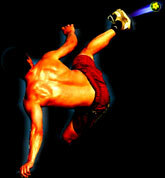 Freestyler check-in info has been updated, see events page. Net: the venue for preliminary rounds has been confirmed. Please see the updated net schedule for location and directions. Welcoming our two newest major sponsors: Boréale and El Zaz Bar. Thanks for supporting footbag! Preview the Worlds T-shirts on the downloads page. Promo Video released for public view. It was used to gain sponsors' interest and demonstrate what to expect in the coming event. See Downloads page. Order your Tickets TODAY! for the big show- Freestyle Finals. Read more. (Registered players do not need to purchase tickets). Register here. La Résistance starts its guerilla tactics: shredding in heavy traffic, passing out flyers and spreading the word one spectator at a time, in an effort to make direct and personal impact on the people of Montreal. Video coming soon. Tickets for Freestyle Finals are now available locally by phone. Will be available online and by mail order very soon. Rialto Theater confirmed for all 3 rounds of Freestyle! The venue is immaculate (we'll get pictures up asap) and convenient from the downtown area. There's lots of space for shredding or warming-up in the lobby and dance floor, and the place is going to really kick off after Finals, with the after-show party. Worlds will rock! By popular demand, all Doubles Events have been restored. If you wish to register for Women's Doubles or Mixed Doubles, please do so now, or if you have already registered and wish to compete in these events, please make the necessary changes to your registration form. Shred rules have been updated and clarified, see events page. Site Launched! Players should register, reserve lodging, and familiarize yourself with all the info on this site. Sponsor drive: If you know of a company which may be interested in sponsoring Worlds, please let us know on the Sponsors page. Direct contacts are helpful. Media drive: if you know of a TV show, magazine, or other media outlet to which we should send a press kit, please let us know on the Press page. Direct contacts are helpful. Wallpapers, based on this year's Worlds Logos, available on Downloads page.